Newspapers continued to suffer falling circulation and staff reductions in 2018, while social media reported substantial profits. 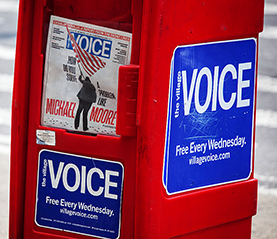 The Village Voice joined the ranks of closed publications. Billionaires purchased Time and Fortune magazines and the Los Angeles Times in bids to save iconic news media. “Vulture capitalists” drew criticism for gutting newspapers for short-term profit, and television chains cut staff after buying local stations. GateHouse Media expanded its holdings to 145 daily newspapers, while Nexstar Media Group agreed to purchase Tribune Media to create the nation’s largest TV chain, with more than 210 stations. More than 300 newspapers published editorials criticizing President Trump for his repeated attacks on the media, and a poll showed more Americans believe the news media than believe Trump. Can legacy media survive in the digital age? Can news outlets regain the public's confidence? Is slanted reporting replacing objectivity?